The secret to a naturally healthy-looking skin revealed. Dubai, UAE, May 23, 2018 : With over 45 years’ experience, STARVAC, the undisputed world leader in cellular stimulation of connective tissue, officially launches in the Middle East a non-aggressive alternative way to fight off cellulite and the signs of aging with their innovative patented technology STRETCHING CELLULAIRE®. 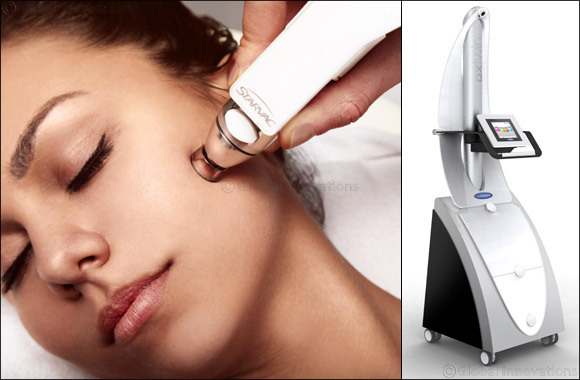 The only technology that will boost the skin’s elasticity and remove cellulite at the same time. Twice as effective as usual skin rolling technique, the process works two ways offering a synergy of actions and is perfectly safe and effective for face and body cares. STRETCHING CELLULAIRE is based on a mechano-transduction mobilization of the connective tissue that converts mechanical stimuli on targeted cells into physiological responses. With the use of patented heads EVO3D, EVOSPHERE and NEOLIFT, the physiological functions of the body are restored and improved. This intense skin fitness: it awakens fibroblasts in the dermis to reactivate their natural synthesis of collagen, elastin and hyaluronic acid while stimulating adipocytes in the hypodermis to naturally enhance lipolysis. STARVAC TECHNOLOGIES offer the exclusive benefit in that they can be used in synergy with dedicated cosmetics during body and face treatments. Applied directly to the skin during treatments, the active ingredients in the Starvac Cosmetics for Technology range penetrate to the heart of the cells thanks to the action of the exclusive treatment heads. STRETCHING CELLULAR can be perfectly adapted to different stubborn areas of the body (belly, thighs, buttocks and arms). A course of 10 sessions, each lasting for 35 minutes, is required for an optimized result. Each session includes a lymphatic drainage that brings all benefits of a manual massage, stimulating microcirculation to promote toxin removal and improve oxygen and nutrient supply to tissues, and increasing the feeling of wellbeing. For optimal result it is recommended to do 3 sessions per week initially. In the first week, you’ll see noticeable difference - skin looks smoother and glowing and legs becomes lighter. As a full result after the treatment, the skin’s elasticity is restored by 49%, waist size is reduced by 6cm, arms by 2 cm and thighs by 6.4 cm. ; (according to studies directed by the French Company of Health Accreditation). This procedure is painless and effective as it is directly applied to the skin, to breakdown hardened fibrosis tissue, restore the elasticity of the skin and redefine your figure and make you feel relaxed afterwards. Having a healthy body with a natural glow at any age can now be achieved with STARVAC technologies. The renowned high-end beauty lounge and day spa, NStyle at The Dubai Mall, will be the first one to have this innovative machine to cater to the beauty and wellness needs of its customers. Treatments include slimming & firming care, rejuvenating leg treatments, stretch mark treatment and anti-aging facials. Visit NStyle Beauty Lounge to check for any treatment recommended for your beauty and wellness concern.